Shale rocks are generally dense and black-coloured, formed from mud deposited at the bottom of past oceans, now solidified into rock. This mud is rich in un-decayed organic matter - that's what gives shales their black colour. When heated, the organic matter is transformed into oil and gas. Once it has formed, some of this oil and gas is able to move out of the shale layers, rising through overlying strata, where it may become trapped in sandstone or limestone layers. This oil and gas is what we consider to be 'conventional' reservoirs, where we have usually looked for oil. However, it has always been known that much of the oil and gas formed during burial remains behind, trapped in the shale layers. Compared to sandstones and limestones shales tend to have lower porosity, making it harder for the oil and gas to move about through the shale. This means that it is harder to extract gas from shale than from conventional reservoirs where the fluids can flow more freely. So how is shale gas extracted? Firstly, a well is sunk, which travels vertically through the overlying strata. 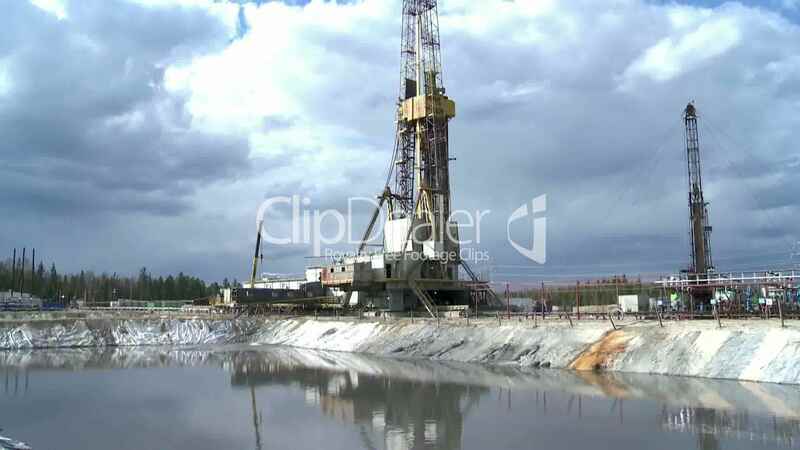 When it reaches the shale layer, it turns sideways, drilling horizontally. Modern wells are capable of drilling over 10km horizontally: such wells are called 'extended reach laterals'. This part is absolutely no different to conventional drilling. Once the horizontal well is drilled, it must be hydraulically stimulated, or as it has become known, "fracked". The horizontal well is "fracked" in portions, stage by stage every few hundred meters or so, meaning that a 2km lateral well might need 10 to 20 stages. For each stage, the targetted section of the well is sealed off, and water is pumped down at high pressure. This water will contain about 1% chemicals that make the stimulation more efficient: surfactants (basically like detergent) that make the water more 'slippery', so less pressure is needed to pump it; and viscosifiers, that help the water carry proppant (more on that in a moment). The pressure of the water is sufficient to open up pre-existing fractures in the rock, and to create new ones. These fractures are important, because they provide a pathway for the gas to flow out of the shale rock and into the well. Above I pointed out that it is difficult for oil and gas to flow through shale rocks. It is the fractures that allow them to flow into the well. Towards the end of the stage, proppant is pumped with the water. Proppant is usually just sand and gravel, although ceramic beads can also be used. The proppant is pushed into the fractures that have been created, literally 'propping' them open, ensuring that the gas can continue to flow. Each stage takes a few hours of pumping, so to "frack" all the stages of a lateral might take a week. Once that is completed, the well is ready for production. A small 'Christmas Tree' valve is placed on the top of the well, and the gas may continue to flow for years without any further intervention. There's suddenly a lot of media fuss about fracking. It must be a new technology, right? Wells were first hydraulically stimulated in the 1940s. It has been a standard tool in a driller's toolbox for a long time. Horizontal wells are in fact far newer, really only becoming common in the 1990s. Some would argue that the current developments have more to do with horizontal drilling than they do hydraulic stimulation. However, even with these developments, many geologists felt that it would never be possible to extract gas from shales at economic rates. George Mitchell, a Texan, persevered through the 1990s, improving the technique, to show that it was in fact possible, and the shale revolution was born. Since then, a drilling boom exploded as American companies realised they didn't have to look abroad, or in the deep and treacherous waters of the Gulf of Mexico, because huge volumes of oil and gas were to be found under Texas, Colorado, Pennsylvania and now 30 other US states. So hydraulic stimulation, or "fracking", is a very well established technique. Horizontal drilling, just as essential to shale development, but much less talked about, is newer, developing in the 1990s. However, to extract gas from shales requires more fractures than in a conventional reservoir, as they are initially less permeable. Therefore, the volumes of water being injected for shale are typically larger than that used previously in conventional reservoirs. So while current developments are not using new technology, it does represent a scaling up of that technology. I've heard about scary-sounding chemicals contaminating water supplies. Is this true? Opponents of fracking sometimes talk about the 500 toxic chemicals needed to "frack". I don't think any stimulation needs 500 different chemicals: that's probably the total number used in the history of the technique, not the number used for a single stimulation. The two main chemicals used are surfactants (found in most soaps/detergents) and viscosifiers (typically guar gum, used in many food products). While not hideously toxic, I wouldn't want to drink water contaminated with surfactants and the like (who'd want to drink the sink-water after they've done the washing up). In addition, the water injected during "fracking" comes into contact with the deep shale rocks. These sometimes contain heavy metals and salts, which may also enter into the "fracking" fluid. The most obvious way for these chemicals to enter groundwater is if they are spilled on the surface. There is an example from Louisiana where 17 cattle died after undiluted KCl was allowed to spill off of a drill pad. Many of the reported issues in the US are due to the ponds used to hold the waste fluids: open pools lined with plastic. The lining of these ponds has been known to tear, or if it rains heavily they can overflow. Ponds like this are not allowed in the UK for exactly these reasons. In the UK waste fluids must be stored in double-lined steel tanks: this is a major difference between drilling in the UK and the USA. Safe management of fluids on the surface should be standard practice for all oil and gas operations - you can read here all the precautions Cuadrilla have taken at Balcombe, layer upon layer of protection to ensure that no substance on the drill site is allowed to leak. The secondary concern, of course, is what happens when the fluid is injected into the ground. "Fracking" takes place well below the water table, typically at depths of 2 - 4km (most potable ground water is found within a few hundred meters of the surface). So there is a lot of solid rock between where the fluid is injected and any potable water. For the injected fluids to contaminate groundwater, two things are required: (1) a path (such as faults and fractures) along which these fluids could migrate, and (2) a force to push these fluids along this path. If there were an easy path allowing fluids to move upwards, then the oil or gas, more buoyant and more mobile than water-based "frack" fluids, would have already travelled through these paths during the 200 million years of geologic history for which the gas has been trapped. Therefore, the fact that the gas is still trapped there to start with tells us that such paths are unlikely. As for a driving force to push the fluids along such a pathway, should it exist? The water-based "frack" fluids, with their various additives, are of a similar density, or perhaps even more dense, than the brines that fill non-gas-bearing rocks at these depths, and of course much denser than oil and gas. Therefore, they will tend to sink downwards, rather than rise upwards. There is no driving force to push the "frack" fluids back towards the surface. So we have no pathway, and no driving mechanism, to cause injected "frack" fluids to rise upwards towards potable groundwater sources. This was the conclusion of a recent study into the possibility of hydraulic communication between shale layers are depth and shallow groundwater bodies, finding it "physically implausible". That's all fine in theory, what about the evidence? Well, a number of studies have been done on water quality in shale areas. Only one, a recent paper by an Arlington group has suggested any kind of link between drilling and contamination by "chemicals". They found a correlation between arsenic and selenium levels and proximity to natural gas wells. They are uncertain in their conclusions, however, as there are a number of possible causes for their observations. Moreover, they do not link their observations with any communication of "fracking" fluids from depth - if drilling is to blame, they believe is likely to be due to vibrations from drilling operations that agitate old, rusty water wells. This agitation of old rusty metal is the most likely source of the observed metals. The majority of water quality studies have found no evidence of fracking-related chemicals in groundwater: some (one from the Duke team, one by Molofsky et al) found no evidence of any effect whatsoever on water quality. One from the Duke team found evidence for methane contamination (see below), but no evidence for "fracking" fluids. I've also seen videos of a tap catching on fire? Is methane leakage a problem? Perhaps the most dramatic footage in the famous Gaslands film is the scene where the farmer can set his tap water on fire. This is caused by methane gas contaminating groundwater. Methane itself is not toxic in any way, although if it builds up in large enough quantities it presents a fire hazard. There are two potential ways that methane trapped at depth in shale rock could get into shallow groundwater - through a pathway in the rock, or through a gas well. As above, if there were an existing pathway through the rock to the surface, then the gas would have already taken that route during the millions of years that it was otherwise trapped. Unlike "fracking" fluids, methane is buoyant and mobile. In drilling a well, a new potential pathway is created for methane to get to the surface. When wells are drilled, they are lined with several concentric layers of steel, called the casing. When all is as it should be, the gas flows up the middle of the well, inside the casing, to the surface. The casing is fixed into place with a layer of cement that fills the small gap between the casing and the rock. If there are gaps or cracks in this cement then methane can move up through this gap (sometimes called the annulus) towards the surface. Of course, the crack/gap has to run all the way from the shale layer to the surface. Well bore integrity has long been known as a potential problem for all oil and gas wells, for both conventional and shale reservoirs. There have been definite examples where poor casing/cement has lead to methane migration into shallow groundwater. Dimock, Pennsylvania, is probably the best-known. The company involved was cited for a number of violations of drilling regulations, and fined heavily. The wells have since been repaired, and methane levels have fallen back to below safe minima. Casing and cement is something the industry has been working with for a long time - there are monitoring tools that can be used to check that there are no gaps or cracks in the cement, and, as at Dimock, it is possible to repair problematic casing. The majority of methane-in-groundwater complaints come from Pennsylvania. This perhaps inevitable, because methane occurs very commonly in groundwater in PA. There are a number of natural ways that can lead to methane in groundwater. Of course, that means that determining when gas drilling is to blame, and when it is natural, can be problematic. We know at Dimock the gas was drilling-related. But how common is this problem. There have been three main studies here, two by the Duke team, one by Molofsky et al.. The Duke team studied the Fayetteville shale, Arkansas, and did not find any evidence for drilling-induced methane contamination. However, when they examined the Marcellus (Pennsylvania), they found evidence for drilling-induced methane contamination. Yet this paper has come in for substantial criticism for two main reasons: the number of samples analysed (only 160ish), and the apparent non-randomness of where the samples were taken from. To address this, Molofsky et al conducted a much wider sampling regime (over 2,000 samples). They found that if you lived near a gas well, there was a 3 - 4% chance of finding methane in your groundwater. However, if you lived in an area with no drilling, there was also 3-4% chance of finding methane in your groundwater. When you look regionally, whether or not you are in a drilling area doesn't appear to affect the probability of groundwater methane occurrence. What can we conclude from this? Well integrity and methane leakage is an important issue for the industry, one that it needs to keep on top of. We've seen at Dimock that if a company takes shortcuts, and violates regulations, this can be an issue. Importantly, there are ways to check cement integrity once a well has been drilled, and ways to repair problems. The question is, how widespread is this issue? The data from Molofsky et al appear to show that it is likely to be a few isolated incidents, rather than a widespread problem. Reviews by the US Groundwater Protection Council have come to a similar conclusion. I've heard that 5% of wells fail immediately, and that 50% fail eventually? This is a statistic often cited by opponents of drilling looking to highlight the methane leakage issue discussed above. The statistic comes from a paper by Schlumberger examining wells in the deep Gulf of Mexico, and particularly the chart on page 2. Firstly, it's worth noting that this 'paper' is basically an advert by a company selling well repair solutions, so it's in their interest to 'big-up' the stats as much as possible. More importantly, what do we mean by 'well failure'? In the context of shale gas extraction, we surely mean that a well that is allowing methane to leak into shallow groundwater. This is where the use of the above statistic is somewhat disingenuous. The statistics in the paper are for sustained casing pressure, or SCP. This is where a portion of the annulus remains pressurised when it shouldn't be. This is absolutely not the same as a well leaking - leaking well will probably experience SCP, but that doesn't mean that SCP indicates a leaking well. Equally disingenuous is the fact that these stats come from deepwater Gulf of Mexico wells. Drilling is a lot more challenging when there is a couple of kilometers of water between your rig and the ground (as the Deepwater Horizon accident showed). It's only in recent years that drilling technology has advanced to enable us to drill there at all. It's not a fair comparison to link wells drilled in the GoM with onshore shale wells, the drilling and casing of which is no different to the thousands of conventional onshore wells we've been drilling for almost a century. It'd be like using the number of crashes in an F1 race to predict how many accidents there'll be on the M25. Deepwater GoM wells are at the limits of our technology. Shale gas wells are far more mundane. If we really want to understand how common well casing issues might be in the UK, surely the best place to look is at our many current onshore wells. There have been over 2,000 wells drilled onshore UK. Whether on not they are "fracked" or not has little bearing on casing integrity. These 2,000 existing onshore wells will be no different to shale gas wells. I'm not aware of any complaints of casing integrity issues or methane contamination from any of these existing sites. Didn't fracking also trigger an earthquake in Lancashire. Is that common? It did. In 2011, when Cuadrilla "fracked" a well near Blackpool, two small earthquakes were triggered. Both were very small, at the limits of what humans can feel, and would have caused a similar amount of shaking to an HGV driving past your house. It's a fact not often appreciated that everything we do in the subsurface carries a small risk of triggering an earthquake, whether it be coal mining, conventional oil/gas, geothermal, hydroelectric. Even quarry blasts are basically man-made earthquakes. Shale gas is no different, there will always be a small risk of triggering small earthquakes. However, this risk is small: only one of the hundreds of thousands of "frack" stages in the US has triggered an earthquake. Any quakes produced will be too small to cause actual damage. DECC have said that every future "fracking" site will require seismic monitoring, and Bristol University have currently deployed seismometers at the Balcombe site (even though they're not planning to "frack" at this stage). I know that some forms of hydrocarbon extraction lead to subsidence issues. Could that be a problem for shale gas? When you remove material from the ground, a space is created that is sometimes filled by the overlying material subsiding into the gap. This is particularly true for coal mining, which can cause severe subsidence. However, shale rocks are dense, with low porosity. That is why they need to be "fracked" to get the gas out. Because of this, they are usually mechanically strong enough to support themselves once the gas is removed. As such, subsidence is not expected to be an issue during shale gas extraction. The Barnett shale in Texas is the oldest shale field: production started over 10 years ago. There has been no measurable subsidence during this time. Several million gallons of water, or 2 - 5,000 cubic meters of water are needed for each well. That's a couple of olympic-sized swimming pools. That sounds like a lot of water. However, it's important to keep that number in context. The average golf course can easily use this much water a week in summer months. Similarly (and a lot more shockingly), UK water systems leak over 3 billion liters (3 million cubic meters) per day. So if we our utilities were to improve leakage by 1%, we'd have enough water to "frack" 30 stages every day. In all but the driest places, shale gas development doesn't pose a strain on water resources. Moreover, water abstraction is regulated in the UK. If demands on water resources are too great, the Environment Agency will not provide a license to abstract water, and utilities will not provide it. What about air pollution, is that a potential issue? Along with water contamination, this is one of the hot issues for shale extraction, because it involves people's health. There have been a number of regional-scale air quality surveys that do not find any evidence for drilling-related air quality issues, including in the Barnett shale and in Pennsylvania. In fact, the Pennsylvania report shows significant improvements in air quality, mainly because coal-fired power stations are being replace by gas power stations. More localised studies have found the occasional issue, mainly it seems with compressor stations rather than drilling sites. However, even these studies have concluded that "the screening results do not indicate a potential for major air-related health issues associated with the Marcellus Shale drilling activities". Fracking might be ok in the wide-open spaces of the US, but surely there's no space for it in the UK? It's true that shale gas extraction is easier in unpopulated areas. Opponents of shale gas often show images of the Jonah gas field, where the land is covered with wells. This is actually a conventional gas field, drilled in the 1990s, before horizontal drilling had taken off. The benefit of horizontal drilling is that you don't need nearly as many well pads. The truth is that the drilling industry is very adaptable. Sure, if you give them a big empty space and tell them you can drill all over it, then they probably will. However, they can cope in far more constrained conditions when it is necessary. Perhaps the best example of this is Dallas-Forth Worth. This is the 9th most populated city in America, with a population of over 6 million. Yet the Barnett shale runs right underneath, and it's being drilled. By using long lateral wells, drilling sites can be squeezed into urban and suburban areas without taking up much space at all. Does the UK have much of a record for onshore drilling? The UK onshore industry does not have a very visible profile. However, it is there: we produce 100 million cubic meters of gas per year. Over 2,000 onshore wells have been drilled in the UK. Of these, about 200 have been "fracked". I've plotted a map of all the wells here. In some places, such as Beckingham Marshes, they manage to squeeze a lot of wells into not-very-much space, without upsetting local people. The UK onshore industry has been very good at staying out of sight, and very good at making sure they do not pollute. If we want to predict what shale gas development in the UK will be like, the first place to look should be the current onshore industry, which does a very effective job working with local communities. I've heard that the methane leaks mean that shale gas is actually worse for climate change than coal. Is that true? Burning coal for electricity produces approximately 3 times as much CO2 as natural gas does. Therefore, switching from coal fired to natural gas fired electricity should represent a significant benefit. CO2 emissions in the US have dropped significantly as gas has replaced coal as a source of electricity. However, natural gas production has the potential to release methane to the atmosphere. Methane is also a potent greenhouse gas, so if shale gas extraction emits a lot of methane, it could counteract the benefits of reduced CO2. This was the premise of a paper by Howarth et al., which has garnered a lot of publicity. However, this paper has come in for a raft of criticism, as most other studies on the subject have indicated very clear benefits from switching from coal to gas. No Hot Air lists some of the scathing comments about the Howarth paper. A study funded by the EU Commission concluded that, with respect to greenhouse gas emission, domestic shale gas production has a similar footprint to imported gas (that has to be compressed and shipped to Europe from the Middle East), and a significantly better footprint than coal. Even if it's better than coal, gas is still a fossil fuel. Surely we should be focusing all our efforts on renewable electricity? Now we're on to a more serious criticism of shale gas development. We know we already have more fossil fuel reserves than we can safely burn without causing catastrophic climate change, so why are we bothering to look for more? My answer to this comes in two parts: firstly is to point out, as above, that for a unit of energy produced, shale gas emits less than half as much CO2 as coal. If we are to avoid climate change, there must presumably be an upper limit to the rate that we can emit CO2. If the treat of climate change requires us to ration our CO2 emissions, it seems obvious that we should choose the fuel source that gives us the most energy for that ration of CO2 emission. That fuel source, by a significant margin, is gas. It's correct that we should leave a large portion of our current fossil fuel reserves in the ground. That portion, however, should be coal. Moreover, renewable energy currently requires flexible backup sources - an abundance of gas provides this. My second argument relates to how we get to a point where our CO2 emissions are reduced. A common call is that 'we should be investing in renewable energy sources'. This is absolutely true. However, in order to invest, you need to have money to invest. Given our current economic struggles, it becomes harder and harder to politically justify renewable energy receiving public money, either as a supplement on bills or as a direct subsidy from the treasury. If the economy improves, there will be more money available to invest. In my opinion, we should be ring-fencing a proportion of the taxes made on shale gas development, in order that they be re-invested into renewables and/or next-gen nuclear. This would ensure that in the short term we reduce our CO2 emissions by replacing coal fired power, but that in the long term investment continues in alternative energy sources, such that they will be ready as soon as possible. That's the theory, how does this bear up to reality? Well, Texas is the undisputed home of shale gas, with the Barnett, Eagleford and Haynesville shale plays. Yet, perhaps surprisingly, Texas is also one of the leading states in terms of renewable energy, and the renewables boom has occurred at pretty-much the same time as the shale boom. In Texas, at least, a booming shale gas industry has gone hand-in-hand with booming renewables, rather than competing with each other. Will shale gas have an impact on my gas bills? This is somewhat uncertain, and as a geoscientist I'm probably straying outside of my main area of expertise. The most recent report commissioned by the government suggests prices could fall by 25%. However, other reports have suggested it would have less of an impact. However, it's important to look at the economic impacts beyond consumer gas prices. At present, we expect to be buying more and more gas from places like Norway and Qatar. That is money that leaves the UK economy for good, never to be seen again. It creates no jobs, and pays no taxes. In contrast, a UK shale gas industry would provide jobs for UK workers. It's true that some of those jobs would be specialists, attracting high-payed international workers. That is still beneficial to the UK economy, because those people will live in the UK, and spend their money here. But there are many lower-skilled jobs involved as well. Moreover, remember the manufacturing chain. For example, well pads need cement. The casing is high quality steel, and each well needs several kilometers of it. That means work for people who make cement and steel. Add in the mulitplier effect, as more employment means more people buying things in shops, eating in restaurants, staying in hotels, and it's clear that, whatever the effect on the gas price, shale development will have a significant impact on the economy. Equally, any gas produced will be taxed. That's money going into the public purse, to be spent on schools, hospitals, or even wind farms. Public finances appear to be somewhat short of cash at the moment. Given our current situation, I don't think we can afford to be handing billions of pounds a year over to Qatar to host an air-conditioned World Cup when we could be reaping the economic benefits of shale gas development at home. "Compared to sandstones and limestones shales tend to have lower porosity, making it harder for the oil and gas to move about through the shale"
Not quite - shales are porous yet largely impermeable. That's why it's possible for them to contain oil and gas but for it to require stimulation in order to release the hydrocarbons. Otherwise, an informative post - thanks. Thanks, entirely correct. The aim for this piece was broad-level, non-specialist, so I made the editorial decision not to define and explain both porosity and permeability separately, instead using porosity as a proxy for both. But yes, the permeability is key. Is it a fact that hydraulic fracturing causes earthquakes as well? I believe I discuss this under "Didn't fracking also trigger an earthquake in Lancashire. Is that common?". Like any subsurface activity (coal mining, conventional oil/gas, geothermal, hydroelectric, subsurface waste disposal) there is potential to trigger seismic events. These will be rare, and of insufficient size to cause damage. After the fuss over the Blackpool events, current DECC rules regarding shale gas and seismic activity are orders of magnitude stricter than any other industry. I read that a fracked well in the US contanimated an aquifier via an old unrecorded oil/gas well, as the fracking fliuds found an easy route upwards. Do you know what safeguads exist in the UK process to stop this happening here. That is a possibility. All wells drilled in the UK are recorded (all the way back to 1902) and available on DECC's website. I've plotted a map of them here. Thanks for the reply , so for that to happen here it would have had to be a pre 1902 drilling that had been totally forgotten - do you know how much drilling there was pre 1902. I like the map hadn't realised there was quite so much pre 1949. I knew there was some activity in the '30s on the Weald - one drilling close to me (and Balcombe), I'll go to the DECC website to see if I can get exact location. presumably at that time looking for supplies in case of war. The short answer is that so far, pretty much every prediction made about shale gas production has underestimated both rates and volumes of production. It is true that production rates drop over time, and quite dramatically at first. However, for drillers this isn't necessarily a bad thing - the very high initial rates mean that the costs of the well are paid off very quickly. After that, although the rates slow down, it's still economical because gas is produced at no further cost, so the wells can be left to produce, even if at slower rates. A more interesting stat is that approx. 80% of production comes from 20% of the wells drilled. So there is clearly huge scope for geologists/geophysicists to make the process more efficient. For completeness you may want to point out that the only "fracked" wells to date in the UK are different to the high volume fracking being used in the US and elsewhere. DECC have confirmed the only high volume fracking in the UK has been carried out in a couple of wells by Cuadrilla (and not without issue, as we know). With regards to well integrity, the people living in these areas care about significantly longer time frames than the 5 year horizon of most politicians and the 10-20 years or so the operators may be on site. Do you have any figures for well integrity over 50-100 years? This is where it gets difficult I guess as well construction and industry standards have changed significantly in that period. Any further research you can link to would be helpful. "However, to extract gas from shales requires more fractures than in a conventional reservoir, as they are initially less permeable. Therefore, the volumes of water being injected for shale are typically larger than that used previously in conventional reservoirs. So while current developments are not using new technology, it does represent a scaling up of that technology"
Many of the UKs existing wells were drilled in the 1970s and 1980s. That makes them almost 50 years old, and we're not seeing contamination problems from these old wells. "This is somewhat uncertain [...] the most recent report commissioned by the government suggests prices could fall by 25%. However, other reports have suggested it would have less of an impact." While we can't be certain about consumer gas prices, the effect on the economy of the development of a resource worth potentially over £1 trillion is not to be sniffed at. Am not an expert in renewables, and I agree that we should be looking to develop them wherever possible. But I wouldn't be so certain about the longevity of renewable energy installations. An excellent summary of the facts, clear and easy to follow. Much needed in order to have an informed and rational debate, instead of the all too common ill-informed, scaremongering nonsense. Unfortunately, the power of the media to manipulate the vocal minority to perpetuate a non-existent threat to an uninformed majority has been demonstrated in the coverage of the Balcombe demonstration. In the meantime children are dying in Syria. Rather than stating how much water is used, can you give numbers for how much water is permanently contaminated by fracking? Whey you water a golf course, the water remains useable as it eventually enters a river or evaporates and becomes rainfall. Note: in support of Nuclear power rather than fracking: in many respects chemical pollution is worse than radioactive waste precisely because it isn't radioactive, it doesn't decay - instead it stays a threat forever! Typically, somewhere between 30 - 60% of the water injected remains trapped in the shale rock. The remainder returns to the surface as 'flowback'. This flowback can be treated and returned to the water system - as has been the case for operations near Blackpool so far, and is typically the case for produced water from conventional oil operations - or increasingly it is recycled for use in future operations, reducing water consumption considerably. It is worth bearing in mind that when you burn natural gas, you get one molecule of CO2, but 2 molecules of H2O. In fact, the quantities of water released by burning natural gas far exceeds the volumes used in hydraulic stimulation. The fresh water used on a golf course is taken up by the grass for use in photosynthesis to create sugars, which are then used for respiration by the plant, creating water vapour (so not evaporation as you state, but transpiration), which, as you correctly identify, ends up falling again as rain. For shale gas, a portion of the fresh water used remains locked in the deep shale formations, and a portion is treated and returned to the water cycles. Meanwhile the natural gas is burned, producing even more water, like the golf course in the form of vapour, which ends up falling again as rain. The non-contaminating wells that were drilled in the 1970s and 80s - how different is the process now in terms of chemicals used - or is it exactly the same? In this respect there is little difference between existing conventional wells and new ones being drilled for shale gas. In fact, given that fluids in conventional reservoirs are more mobile, one could make the case that conventional wells pose a higher risk in this regard (as we have all seen at the Deepwater Horizon disaster). However, to give a direct answer to your question. In terms of chemicals used in the actual drilling of the wells (i.e. drilling mud etc), I would imagine the chemicals used would be pretty similar. Approx 10% (so 200 of the 2,000 wells drilled) have been hydraulically fractured. For the hydraulic fracturing (which happens after the well is drilled), it's difficult to say, simply because there isn't a lot of data available for the older wells (hydraulic stimulation was considered to be such a routine activity that there was no specific data reporting requirements). Some of the fluids used in the past were actually far worse that what is used now. For example, for a while it was common to use gelled diesel as the frac fluid, as opposed to modern fluids which are 99% water and 1% additive. We're even starting to see companies developing frac fluids using only food-grade additives. That said, as I mention above the volumes of frac fluid used for shale are generally larger than those employed in the past for conventional reservoirs. Such a awesome post and article you write up.. you shared always great information and loved your website. Thank you so much for sharing a great post and experiences.